LOCATION This impressive period property is located on the ever popular west side of Horsham, only a short distance from Horsham town centre, main line station with easy links to London and the fantastic Horsham park with Pavilion Leisure Centre. Horsham’s busy town centre boasts a host of independent and national retailers, as well as a John Lewis At Home store and large Waitrose. This attractive location means this terraced house is within walking distance of Greenway Academy, Trafalgar Community Infant School, and Tanbridge House Secondary School. PROPERTY This stunning four bedroom Victorian home comes to the market having been fully refurbished throughout in addition to being extended to create a large family home. The character and charm of this impressive home is immediately obvious on entering the hall where all rooms are accessed including a useful cloakroom. To the front of the property is the lounge with bay window and feature fireplace. To the rear is the unquestionable feature of this well located property, the 26ft kitchen breakfast room. The cavernous space with vaulted ceiling provides kitchen area in addition to large area to entertain or keep an eye on the children. Double doors flood out on to the garden as well as further door leading to a cleverly created utility room. To the first floor are three of the four bedrooms, all of which accommodate a double bed. The family bathroom, like the rest of the house is an impressive space with a suite comprising roll top bath, separate shower cubicle, WC and wash hand basin. 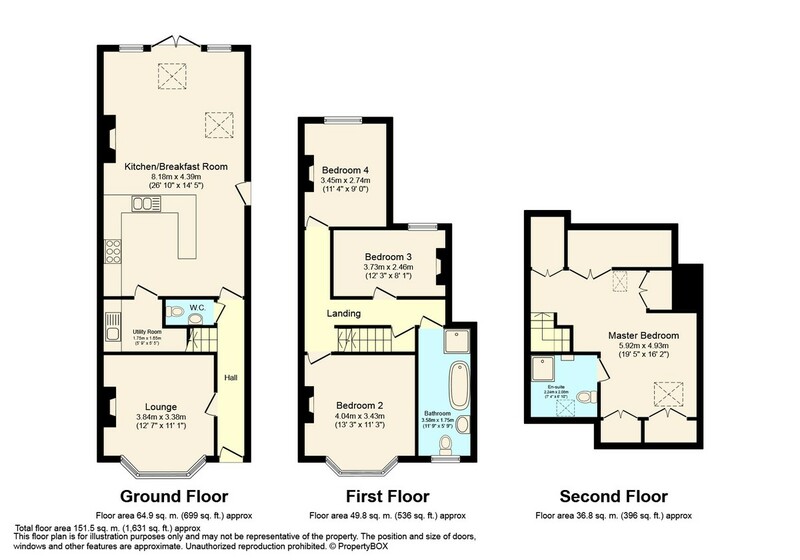 To the second floor is the master bedroom suite with built in wardrobes and en suite shower room. There is also plenty of eaves storage access from this room too. OUTSIDE The west facing rear garden is predominately laid to lawn with patio adjacent to the property all being enclosed with wood panel fencing. To the end of the garden is a large summer house. To the front is a further garden accessed by gate and being enclosed by hedge and fencing. Other residents in the road have utilised this area to create off street parking. Between the property and the adjoining house is a pathway leading to the rear garden.